and the 2nd Saturday of every month from 11am - 2pm. Membership dues support the Warwick Historical Society's educational programs, collection maintenance and preservation, and projects at the John Waterman Arnold House. 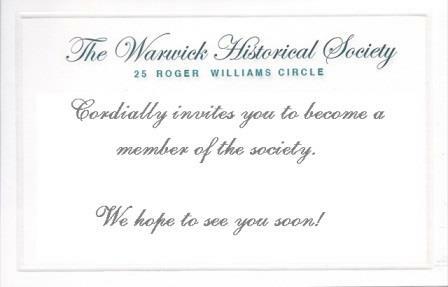 The Historical Society welcomes new members any time of the year. Individual and corporate rates are available. Advance notice and invitations to the Society's programs; including lectures, walking tours, book signings and open houses. Subscription to the Society's newsletter. Opportunity to sponsor WHS events and programs. All memberships are valid for one year from the receipt of dues and are renewable annually. Contributions are tax deductible.